High-performing and as open to the sea as it is to life, the Oceanis 38 boasts new space organization options on board. Evolving to match your requirements whenever you want, she offers a new approach to cruising. She has something for everyone, but is also unique ! Length and beam on the waterline have been extended as far as possible to make the Oceanis 38 quick to cut through the water, while increasing stability. She offers high-performance and habitability second to none on this size of cruiser. Almost everything is possible inside the Oceanis 38. There is wide scope for different combinations in organizing the interior spaces and woodwork ambiances. The choice of a separate shower compartment is popular in the three cabin version. A unique feature on this size of cruiser, the fore cabin’s bed head faces in the same direction as the boat. The Oceanis 38 rethinks the use of the boat, leaving the choice of its initial layout to the owner, while maintaining the potential to change arrangements at a later date. With the Daysailer, Weekender or Cruise, there are three ways to reorganize life on board the same boat. Designed like a floating loft, this version of the Oceanis 38 does away with interior bulkheads in favour of a single room. The view is unobstructed and there is a stunning feeling of space. 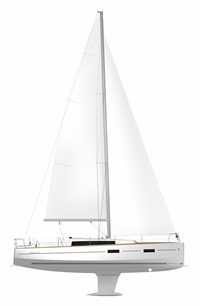 With equipment focussing on the essential, aft space for storage and an open cockpit, the Daysailer is open to everything. Whether she has a two or three cabin plan, the Weekender version of the Oceanis 38 offers the greatest evolving potential over time and is the yacht that offers the greatest choice of layout: open or closed cabins, separate shower, fitted galley, extra inside/outside table, helmsman's seats, etc. More conventional, the Cruiser version of the Oceanis 38 is equipped with a large galley facing the saloon and a bathroom with separate shower. It offers a choice between two or three fitted cabins. With the potential to evolve, the bulkhead can be removed from the fore cabin of this version to return that loft feeling.